Google+ profile URL has 21 digits of unique ID numbers attached to it. This long direct link to your profile is quite difficult to keep in mind especially if you are going to share it will your followers through your blog, social networking accounts and your service portfolio page and is not easy also for others to remember you on the social media websites. In this case, the use of tools which will help you get a shortened URL for your Google+ profile is important. 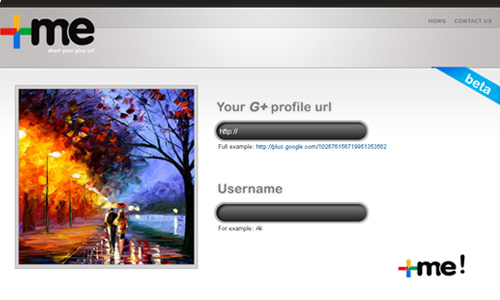 With these tools, you can customize the link of your Google+ profile in short minutes only. 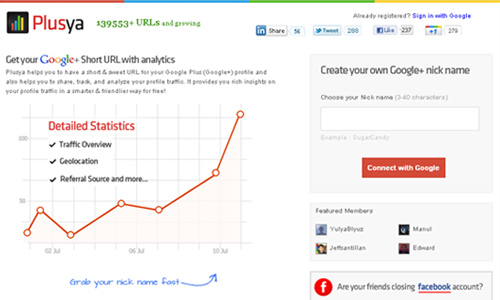 Below are 20 URL Shortening Tools for your Google+ Profile. Check out this list so that the long string of numbers will be replaced with your desired nick name. Enjoy! 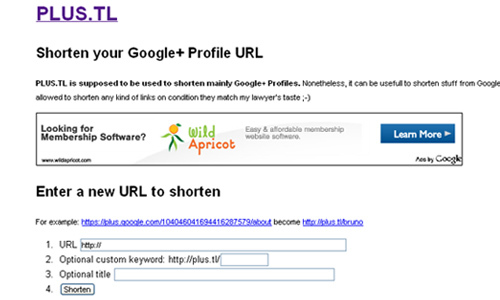 gtPL.US is a free service you can use to shorten your Google+ profile URL. 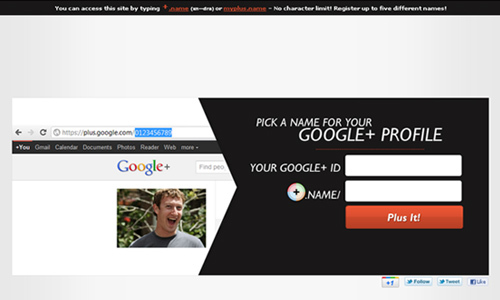 Topl.us is an online tool for making your long, messy Google+ profile URL a short memorable one. 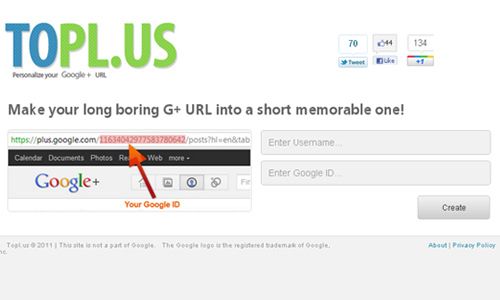 GPlus.to is a service which allows Google+ users to shorten their profile URL into a simple, memorable link. 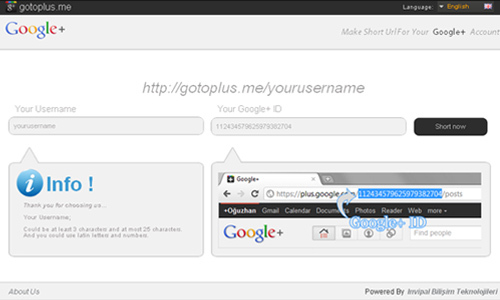 Gotoplus.me is another tool you can use to shorten your URL for your Google+ account. 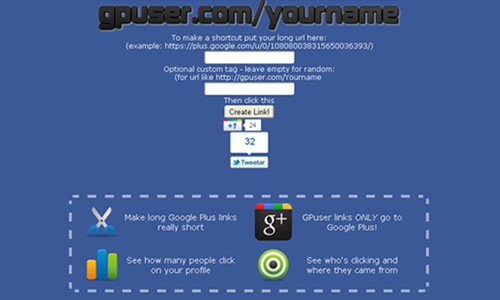 GPuser.com is a service you can use to make your long Google Plus links really short. Plus.ly is another nice service which could set a username at least 3 characters to a maximum of 25 characters, without containing any numbers or special characters. 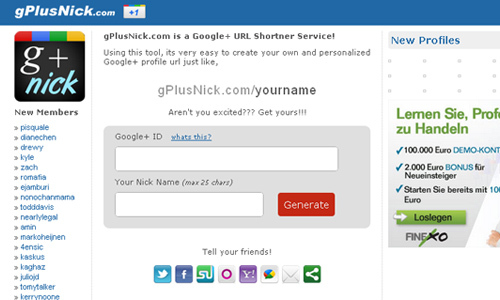 gPlusNick.com is another Google Plus link shortener service which allows you to create a Google+ profile id in the form of gPlusNick.com/username. 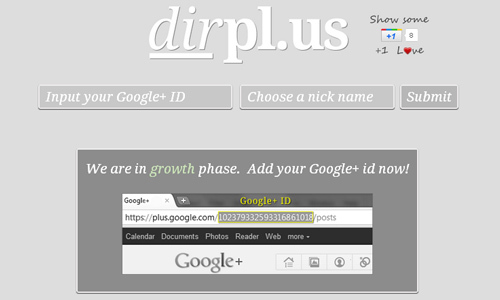 DirPl.us is a directory of Google+ users that enables you to create a short ‘vanity’ URL for your G+ account. 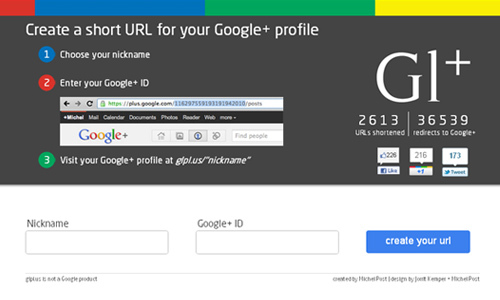 Glpl.us is a service which also creates a short URL for your Google+ profile. 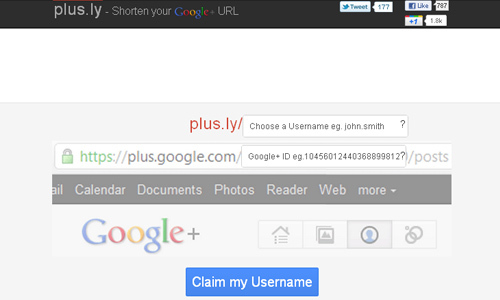 Plusya.com is a google plus URL shortening service which helps you to have a short & sweet URL for your Google Plus (Google+) profile. MyPlus.name is a simple tool for shortening and customizing your G+ profile. 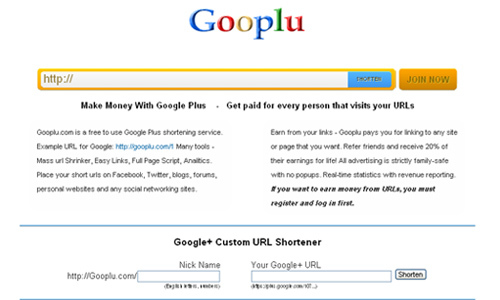 Gooplu is a service which allows you to make a short URL for Google Plus account. 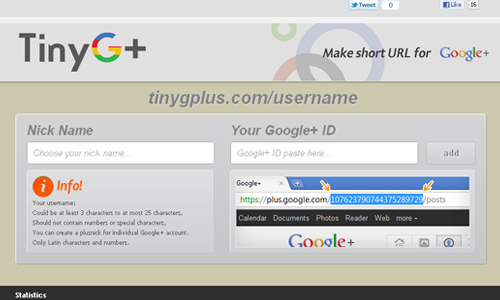 TinyGPlus is a free URL shorting service for making your long Google+ profile URL short. 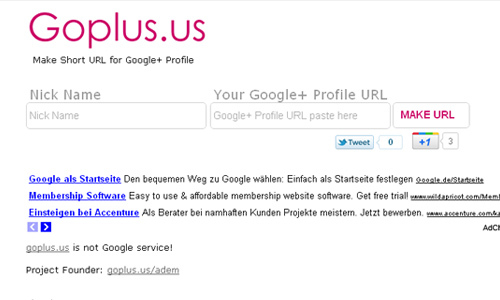 Plus.tl is a service mainly used to shorten Google+ profile URL. 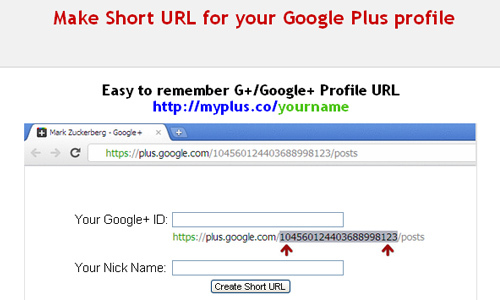 Myplus.co provides a service for shortening url for your Google+ profiles. 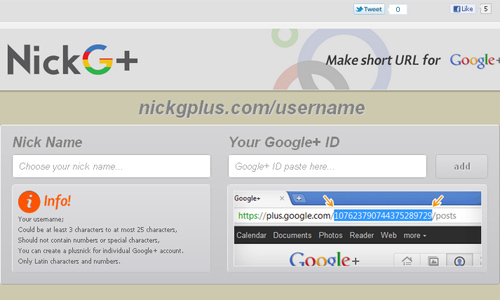 NickGPlus provides a web service to shorten Google+ profile URL. 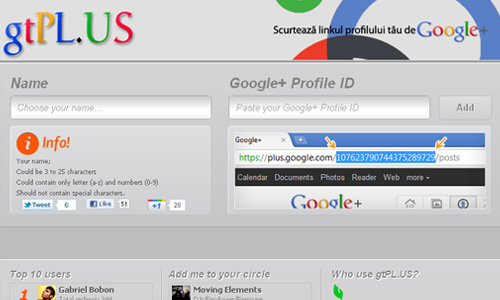 PlusMe.ir will make your long Google+ profile short, easy and free. 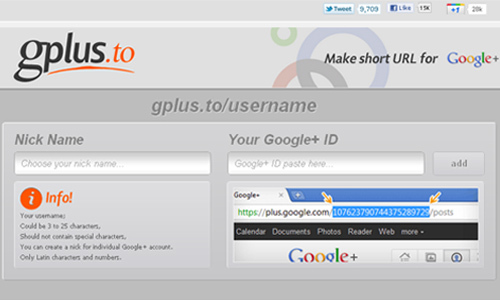 GPlus.is is a free service to create a custom URL for your Google Plus profile. 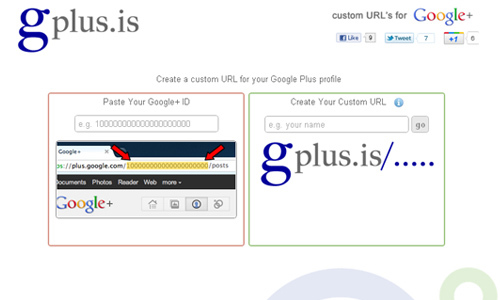 Goplus.us lets you customize your URL for your Google Plus profile. 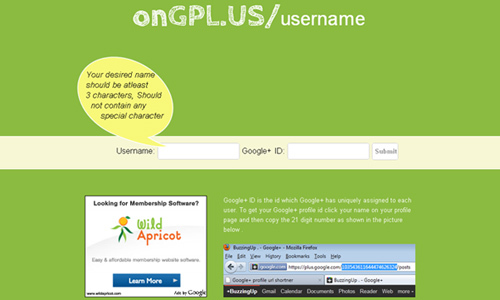 onGPL.US is a URL shortened service which enables you to make short user friendly url for your Google+ profile.